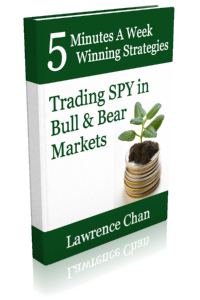 5 Minute A Week Winning Strategies: Trading SPY in Bull & Bear Market is a book on practical SPY trading strategies with consistent performance that is suitable for those who do not have time monitoring the stock markets. No need of fancy computer software. Rules are simple to follow. 5 minutes a week is all it takes. They tell you buy-and-hold will be good for you. They tell you to buy at all time high so that you would not miss the boat. They also tell you the market is crashing and it is best you sell your holdings when the market has already been beaten down badly. Now we’ve all learned that these financial market experts and analysts are there not to help you with your money. They are no better than an average guy out there being told to write something up so that their puppet masters can generate some business, from you. It is time you learn to take control of the situation. It is time for you to discover trading, again. To the right, is a chart of the S&P 500 ETF Spyder (symbol SPY) comparing against the performance of the unique chart patterns described in the book (standardized at 1 unit of SPY). The steady performance of the chart patterns driven trading system shows a stark contrast against the volatile nature of SPY. The trading system has its shares of ups and downs. It is not perfect because trading is all about dealing with uncertainties. It is, however, a strategy preferable over buy-and-hold for anyone who value the safety of their money. 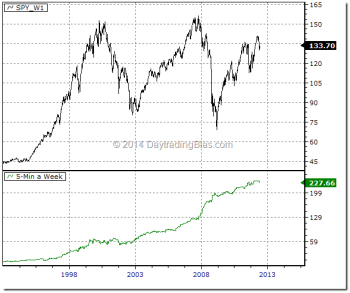 The trading system performs very well historically. At 27% annualized return, it sure beats majority of the fund managers out there. You Are Not Sure If You Can Follow The Chart? We’ve taken this into careful consideration and decided to offer the signals for free to members of our site. All you have to do is check out our S&P Signals page during weekends to find out if any signal has been triggered. You no longer need to worry about the chart reading aspect of the strategy. All you have to do is to follow your plan you’ve chosen from the book and act accordingly. Stop Finding Excuses, Order Your Copy Now!